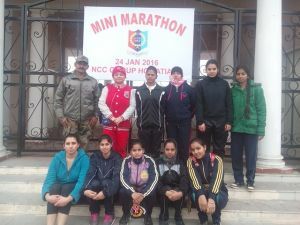 The NCC Cadets of Patiala group organised a Mini Marathon on 24th Jan. 2016 in which around 300 cadets participated. More than 20 NCC Cadets represented our college. The first and second positions were bagged by our students Swati and Priyanshu respectively. Ishnoor Singh Ghuman got 7th position. College Principal congratulated the NCC Cadets.